The World Court Project was started in New Zealand in 1986 by a retired Christchurch district court judge, Harold Evans, and initially led by New Zealanders. This civil society campaign aimed to have the International Court of Justice (the highest legal branch of the United Nations, also known as the World Court) give an advisory opinion on the legal status of nuclear weapons. 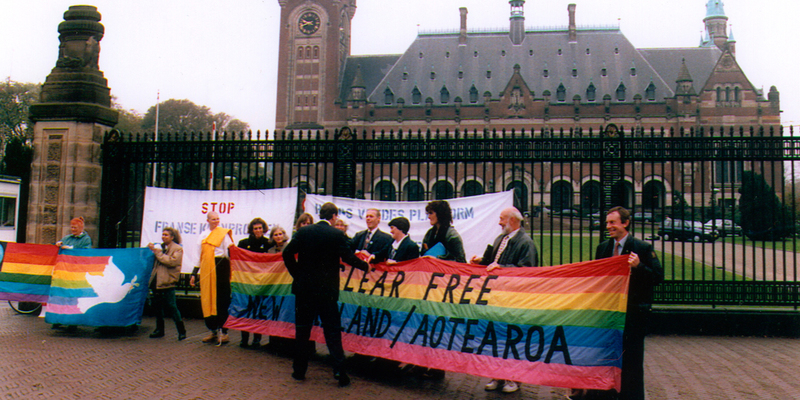 Over 32,000 New Zealanders signed ‘Declarations of Public Conscience’ condemning nuclear weapons and supporting the World Court Project in the early 1990s. Worldwide, the number was nearly 4 million. This was an enormous figure for public engagement in the age before online mass-petitions. After years of campaigning, the Project had its international launch at the UN in Geneva in 1992. The three core co-sponsoring organisations were the International Peace Bureau (Nobel Peace Prize winner, 1910), International Physicians for the Prevention of Nuclear War (Nobel Peace Prize winner 1985), and International Association of Lawyers against Nuclear Arms. 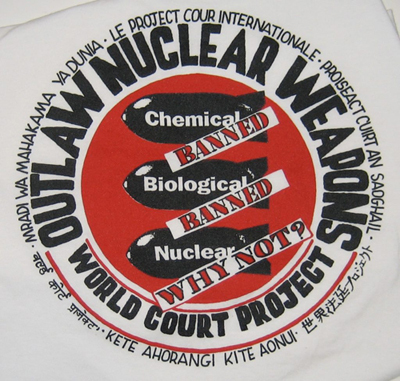 In response to persistent, strategically-applied pressure and lobbying by World Court Project members, the UN General Assembly adopted a resolution in December 1994, asking the Court urgently to give its opinion on the question, Is the threat or use of nuclear weapons in any circumstance permitted under international law? New Zealand Statement to the World Court, 1995. Ever since 1996, the New Zealand government has linked this important normative precedent to its more progressive disarmament objectives, advocating strongly for the elimination of nuclear weapons. For further reading on the World Court Project, see the following publications. Further publications can be found on our website here. 3. Professor Roger Clark, Celebration of Twentieth Anniversary of the International Court of Justice’s Advisory Opinion on the Legality of the Threat or Use of Nuclear Weapons.